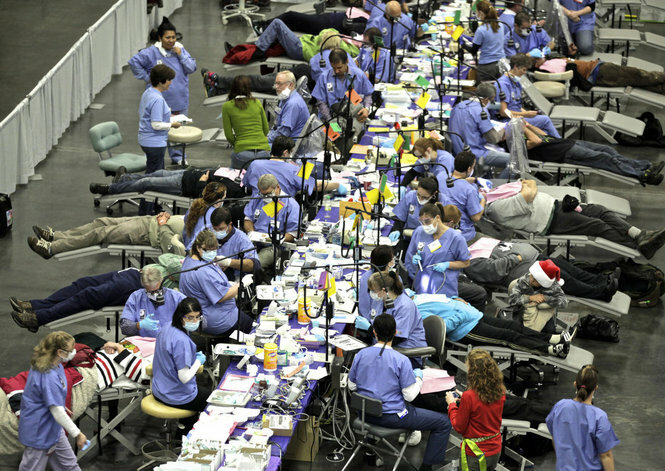 Nearly 300 dentists volunteered their time to help patients in need at the 2012 Arizona Mission of Mercy. Many low-income adults lack dental insurance coverage and even more have to delay any dental because of the costs and other more pressing basic needs. Originating in Virginia and spreading throughout the United States, more than 70 Mission of Mercy (MOM) programs have been held since 2000 to provide free dental services to local residents who otherwise were unable to access such care. Last year the first Arizona Dental Mission of Mercy (AzMOM) turned out to be the largest dental charitable event in the history of Arizona, with over 1,500 volunteers providing 1,659 patients with over $1.25 million in dental services. In 2013, the second Arizona Dental Mission of Mercy will take place on December 13 and 14. Delta Dental of Arizona is once again a major sponsor, with the Central Arizona Dental Society Foundation hosting the event at the Veteran’s Memorial Coliseum at the Arizona State Fairgrounds (19th Ave and McDowell). This year the goal is to serve 2,000 patients. Be a part of this exciting and rewarding day! You can make a donation (every tax-deductible $2 given provides $16 in dental care), or be a volunteer (even if you are not a clinician and have no dental experience…everyone is needed!). Check out the website or contact 480-344-5777 x 309.